Many of us remember fondly the movie The Princess Bride and its search for true love. The world today would have us believe that true love is romance and physical attraction. What we will learn of in this week's study is the biblical version of true love - love that is often found through duty and service first. It certainly is not short on physical attraction but true love focuses more on the lasting beauty within, than the physical and fading beauty without. It is also not the fairytale romance that Hollywood and the media would have us believe it should be, where all things are simple and easy. Instead it takes patience and tolerance and often great heartache and sorrow. True love develops gradually, building act upon act, day upon day, year upon year. In the lives of Isaac and Rebekah, Jacob and Rachel and Leah we find moments of magical romanticism and at other times instances of stoic yet sorrowful hardship. Couple this with the blessings of the covenant of eternal marriage and we discover a path that, though at times testing and tough, is ultimately beautiful and rewarding and true. Abraham being "old and well-stricken in age" makes it sound as though he is dying. He is actually around 140 yrs old and would live another 35 years, marry one more time and have another 6 children. What do you plan to do in your retirement?! "Said unto his eldest servant of his house who ruled over all that he had..." This servant proves to be wise, inspired of God and faithful. We never are told his name in this passage but his example lives on as someone who we can all aspire to be. In the symbolism of this story, who is the master and who is the eldest servant with whom the keys of the kingdom (all that his master hath) are entrusted and is asked to ensure the exaltation of his children (son)? if no woman follows you back, you are cleared of this promise but just never take Isaac back to that land. Why is Abraham so insistent on Isaac not marrying a Canaanite? He wants Isaac to have the blessings of eternal marriage which is the blessings of eternal increase and seed. He could be happily married by contract but it would not be in the covenant and would miss out on the eternal blessings promised to Adam and Eve, Enoch, Noah, and Abraham etc. Also the Canaanites were in general a wicked people who worshiped idols and believed in witchcraft. If we unite with these practices it is very hard to keep ourselves unstained from them. The servant is sent on his search with 10 camels loaded with Abraham's wealth. Presumably much of this was as a dowry for the bride's family. v.11-14 bold and very specific prayer. Do we ever pray like that? v.15 Rebekah, Abraham's grand-niece and Isaac's first cousin once removed. v.17-28 Rebekah fulfills the test (camels can drink up to 30 gallons of water in one day! she only has a pitcher, has to run to and from the well filling up the trough for the camels to drink - it is dusk (eventide) and she came to gather water for someone else initially. These wells are very deep. That is a lot of pulling, hauling, running and time! What an incredible person she must have been to render that kind of service to a complete stranger and his camels when she had family duties to perform. The servant, likely could not believe that his prayers had been answered so quickly and in such a strong and resolute woman. v.21 "the man wondering at her held his peace"This too probably shows the wisdom of the servant. Don't say anything, just watch and marvel! v.27 "I being in the way". Imagine what could have happened if anyone of these involved had not been "in the way" of the Lord, standing in holy places, doing their duty, following the commandments; if Abraham or the servant or Rebekah had not been doing as they should be, at the time in their life that they should be. v.58 but Rebekah again shows her unique strength and determination and faith. She does not linger but instead chooses to depart immediately. The Lord has asked us to hasten his work. In what ways do we sometimes linger instead? In what ways can we hasten the Lord's work. v.60 let thy seed possess the gate of those which hate them. The gate of the city was usually where the affairs of that town or city were organized. Essentially it was like town hall or in modern terms politics. It seems to suggest that at some point Rebekah's descendants would have political control over their enemies. v.61-67 obviously Isaac had taken his mother's death hard, pining, meditating/praying in the fields at night. They see each other and Rebekah is instantly accepted into the family. We are told "he loved her" and she became a comfort to him after his mother's death. This is mission accomplished for Abraham, having done everything he could to ensure his son married in the covenant. v.21 barren - but after much prayer Rebekah conceived 20 years later (see v26) MUCH prayer. Some prayers are just not meant to be answered as quickly as others. Why do some prayers take so long to be answered? v.22 twins and not an easy pregnancy - notice the example of Rebekah. She had a question of the Lord and went to the Lord. Rebekah's example shows all women that the Lord truly is no respecter of persons but answers all prayers, men and women. Rebekah's spiritual strength is a fine example to latter-day saint women all over. Personal revelation is available to every worthy woman in the gospel. From all we see, Rebekah is a far stronger personality than her husband, who seems more gentle and passive in character. What can we learn from this contrast between husband and wife and the traditional characteristics we assign patriarchs and their wives? v.25-28 Esau was a man's man - sporty, smart, physical, loved his venison while Jacob seemed a quieter, wholesome lad. v29-34 Esau (nicknamed Red (Edom) because of his red hair and desire for red pottage - lentil soup) gives away his birthright/inheritance/blessings for a bowl of lentil soup. What was really the issue - pride, laziness, desire for immediate gratification. Do we give up prayer or scripture reading, home-teaching for a TV show or something else as trivial? The fact that this was all prophesied while they were yet still in the womb - does this suggest that we bring certain characteristics with us? If so, how are we supposed to overcome certain inherent weaknesses we developed previously? Whose fault is it we have those characteristics? Can Esau be excused because he brought that characteristic with him from the previous existence? What is a birthright and what is the blessing? The Birthright was the physical inheritance of usually the eldest son. When the father passed away the estate, wealth, cattle etc was divided into equal portions between each son except that the eldest son received a double portion. So if a man had 3 sons, the estate would be divided into 4 and each son would receive a single portion except for the eldest son who received a double portion. This double portion was expected to be used to look after and protect the widowed mother and servants and unmarried sisters. The eldest son also became the social patriarch of the family and leader of their business interests. The Blessing was a spiritual inheritance of the priesthood promises, blessings and keys. It was also a transferal of the spiritual or religious leadership of the family. Again this was traditionally passed to the eldest son but the predominant qualification for receiving this special blessing was the righteousness of the recipient. v.1-6 famine causes Isaac to move his family but God tells him to stay in land of Philistines and not go down to Egypt. Isaac stays and blessings of Abraham are renewed between God and Isaac. v.7-11 Isaac and Rebekah and Abimelech go through the same experience as Abraham, Sarah and Pharoah. Why? What are we to learn from this? v.17-22 the three wells - Strife and Opposition and Patience. what is the meaning of these 3 wells? Some say that they represent the three Jewish temples of which Solomon's and Herod's were destroyed and the third is prophesied to be built in the last days. I would be very interested to know if any LDS students can attribute symbolism to these wells. What is clear is that Isaac seems to make a habit of avoiding contention and strife in favor of quiet patience throughout his life and thus on one level the wells are very symbolic of his life. On another level all those who wish to taste of the living waters of the gospel may often need to go through strife and opposition and may need much patience if they wish to partake fully of the temple blessings. v.23-25 pitched tent in land of the temple, built an altar and dug a well. How might these three things symbolize the kind of life the Lord wishes for us? We would all do well to follow this simple pattern in life. v.26-32 Philistines come to Isaac asking for peace due to his example and seeing he was blessed of God, Isaac obliges. The well produces water. v.34-35 Esau takes two Hittite wives at the age of 40 - once more showing disdain for the ways of the Lord and the covenant and in the process making his parents very sad. v.1-5 Isaac, old and going blind, plans on passing blessings onto Esau. Why would Isaac do that when Esau has shown such disdain for the covenant? v.6-17 Rebekah devises a plan to ensure Isaac receives the blessing and birthright he legally bought. It involves deceiving Isaac. Why was it necessary to deceive Isaac? v.18-29 Isaac blesses Jacob with the blessing. v.30-40 The deception is discovered but the blessing cannot be reversed as it was sealed with the sacrament of sustaining (v.37). Verse 33 confirms that whatever deception may have taken place, Isaac now recognizes that this is of God and declares Isaac's blessing valid with the words "and he shall be blessed". Esau is given a blessing, but of subservience until later generations. v.41-46 Esau angrily decides to kill Jacob once his father dies. Rebekah hears of his plan and tells Isaac to leave and go to the land of their fathers (Haran). She convinces Isaac this will prevent Jacob from marrying a Hittite and that it is for the good. There seems to be a substantial amount of aggressive manoeuvrings by Rebekah when it comes to Jacob's well-being. Was she justified in these actions by the earlier revelation from God (see Genesis 25:23) and if so why would she have kept this secret from Isaac? Isaac receives birthright over his elder brother Ishmael. Jacob receives the birthright over his elder brother Esau. Joseph received the birthright over his elder brothers. Ephraim received the birthright over his elder brother Manasseh. What does this remind us about the Lord's standard for inheriting the blessings and birthrights. Is it tradition or righteousness that takes precedence? v.1-5 Isaac in his old age sends Jacob to his uncle's land to find a wife. Once more he is instructed as was Isaac not to marry outside of the covenant. For both Jacob and Isaac the foremost instruction the top priority in marriage was not make sure you are in love, or make sure she is blonde, or make sure she has green eyes, or make sure she is a career woman or make sure she has this characteristic or that skill. The first and foremost thing they are to look out for in marrying is someone who will allow them to continue in the covenant. What is our equivalent of this today? What does that tell us we should be teaching our children about marriage and love? Why was it safe for Jacob to return to the lands of his fathers but forbidden of Isaac? What was Abraham worried about that Isaac and Rebekah are not? v.6-9 what was Esau's motive here - obedience or wanting to be liked, to find favor? Do we obey commandments because we know we should and it is is right or do we do it to look good in the sight of others? To be fair to Esau it would seem in future chapters that he has turned his life around and has embraced the gospel. Despite this turn around he still missed out on the birthright. who sleeps with stones/rocks for pillows??? Some significance must be laid on these stones. Does anyone know what they represent? Jacob dreams of a ladder set on earth and that reaches to heaven with angels going up and down on it. What makes this different from Tower of Babel? Satan often replicates the things of God in an attempt to deceive us. What Jacob saw was the natural and proper progression into heaven - the true order from telestial through to terrestial and then celestial glory with the angels attending up and down and within these progressions. Satan convinced people that they could build their own ladder/steps/way into heaven. Here Jacob learned of the true order in heaven along with its covenants and promises. In his dream Jacob sees God and is promised the blessings of Abraham. v.16-22 Jacob indicates a lack of awareness originally of where he was but then covenants to accept the Lord as his God and to give him a tithe. Could it be that being in the presence of God and being educated of God this is Jacob's temple endowment? Do the stones hold some temple significance? v.1-8 Jacob meets shepherds of Haran who know his uncle Laban. They inform him that the water is currently not available as all the flocks are to be gathered before the stone protecting the well is rolled away. Again it would seem there is great symbolism here. Water symbolizes life and I know of only one other rock, in scripture, that was rolled away and that was in the Garden Tomb to reveal the resurrected Lord. Simply put the story of the Atonement like the story of Jacob and Rachel is one of love. Because of his love for us he conquered death, He rolled away the stone of the tomb and invites us to partake of the living waters of eternal life. 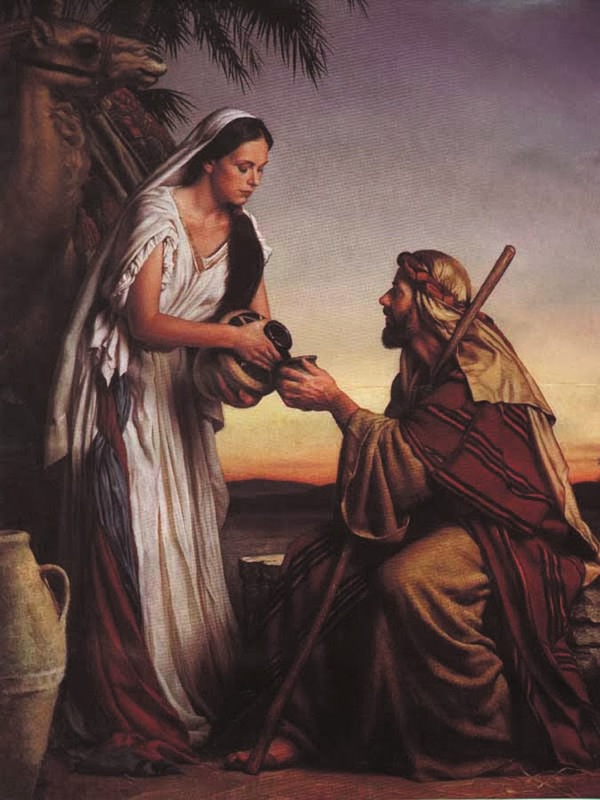 We, the church of the Latter-days, represented by Rachel are the future bride invited to partake of the living waters of the Saviour and his gospel. When we partake and invite him into our homes and our lives then eventually we become as one. As with all studies of the scriptures there are likely multiple symbols and multiple layers of meaning and I would be very interested to hear some of your thoughts on these possible meanings and symbols. There also seems to be a great emphasis on these meetings at the well, throughout scripture. I would imagine there is also some great symbolism to be found in further study of such meetings. What we do know is that the well was a pivotal point of social life during these times. The water was the life force for families and their cattle and herds. No one could live without it. Thus these wells were considered very important and worthy of protection (possibly the reason for the stone covering the well in this case). Undoubtedly, based on the social structure of the day, the well would have been a prime spot and a logical place to go to see who the young eligible women of the area were, on any given day. v.9-14 Jacob boldly rolls the rock away so Rachel's sheep can be watered. He tells Rachel who he is and she tells her father and Jacob ends up staying for a month. v.15-20 how shall I pay thee - Jacob asks for his daughter Rachel who is beautiful and well-favored (but is also the younger sister of Leah -who just has pretty eyes). Laban confirms that he would prefer Jacob, as opposed to anyone else, to marry her and they agree a price of seven years labour for her dowry. I love v.20. Is there a more beautiful love story in all the bible? But that beautiful statement underlies a strict determination not to settle for less than the marriage of the covenant. He traveled to a strange country and gave 14 years of his life to get the covenant marriage he knew he should. v.21-30 I'm not sure how Jacob didnt twig that it was Leah he was marrying but somehow the deception was pulled off (maybe veils had something to do with it?) and Jacob goes to Laban after the wedding night. Laban explains the customs (maybe he made the initial promise assuming that Leah would already be married before the seven years had passed?) and promises Rachel to Jacob if he waits the ceremonial first week of marriage and if he promises to then work another 7 years as dowry for the second daughter. Jacob agrees and marries Rachel but loves Rachel more than Leah. v.31-35 Jacob and Leah's marriage is a loveless marriage, a marriage of duty. Leah feels unloved and has children hoping that they will help Jacob love her. She has 4 sons - each son's name reflects Leah's sad plight. Leah stops having children at this point, seemingly somewhat happier with life and not feeling the need to please Jacob with more children. While the Hollywood portrait of relationships is often love at first sight and intense physical attraction, the true order of marriage includes duty and sacrifice; it involves accepting people with very different habits and quirks to yourself; it means faith; sometimes it means accepting heartache and patience; sometimes it can feel like it is loveless but the key to a successful marriage is focusing on a covenant marriage thus allowing the fulfillment of eternal blessings. As we each focus on the covenant of marriage, respect grows and eventually true love blossoms.